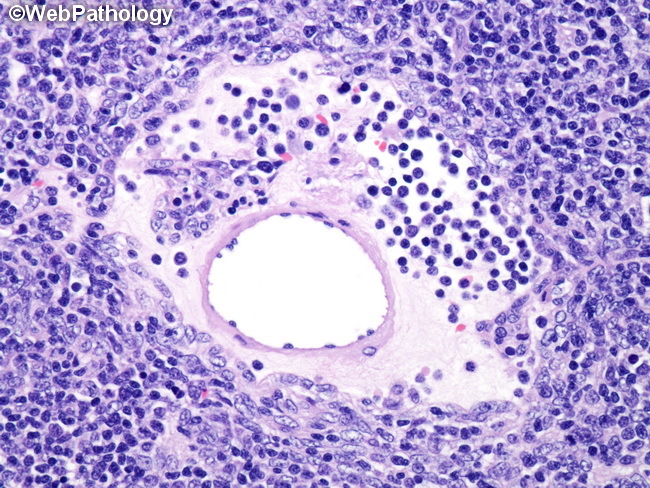 Type B2 thymomas contain perivascular spaces consisting of a central venule surrounded by a clear space which contains proteinaceous fluid and lymphocytes. Hassall corpuscles are sometimes present. Medullary foci are uncommon. In patients who present with myasthenia gravis, lymphoid follicles may be present in the fibrous septa. Preoperative corticosteroid therapy may alter the appearance due to lymphocyte depletion, histiocytic infiltrates, and necrosis. Predominantly epithelial (and lymphocyte-poor) areas resembling type B3 thymoma are seen in almost 40% of cases of type B2 thymoma.